John H. Stevenson, IV, 77, passed away from complications from esophageal cancer Wednesday, October 10, 2018. He was born December 15, 1940 in Oakland, MD. He was preceded in death by his parents, John Haddock Stevenson III and Willa Marie Paulie and his brother Fred Stevenson. Surviving is his wife of 35 years, Linda Sue Cott; daughter, Valina Enslen, Wagoner, OK., grandsons, Drew Curley, Tulsa, OK, and Patrick Curley, Lubbock, TX; sister, Susan Morgan, Hawthorn, NV; Sister-in-law Rhonda Stevenson, Tomsbrook, VA; and scores of nieces and nephews, extended family and special family Gary Stubblefield. John graduated from High School in Arlington, TX, then studied History at New Mexico Highlands University in Las Vegas, New Mexico. John served in the US Marine Corp as a Sargent and was a Vietnam Veteran with a Honorable Discharge. He was a Security Guard at the Port of Catoosa before joining the Tulsa Police Department, where he retired in 1996, after 27 years. 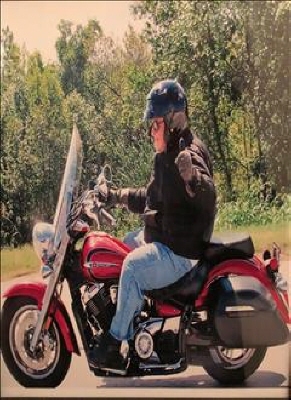 John was a member of the Blue Knights Oklahoma Chapter 1's, â€œRide with Pride.â€ In his spare time he enjoyed camping, boating, riding motorcycles, shooting at the Gun Range, reading and cross word puzzles. Cremation with interment in the Columbarium Wall at Fort Gibson National Cemetery. Memorial Services to be scheduled at a future time. In lieu of flowers the family requests that a Memorial donation in memory of John be made to the Marine Military Academy, 320 Iwo Jima Blvd., Harlingen, TX 78550. To send flowers or a remembrance gift to the family of John Haddock Stevenson, please visit our Tribute Store. Guaranteed delivery before John's funeral service begins. "Email Address" would like to share the life celebration of John Haddock Stevenson. Click on the "link" to go to share a favorite memory or leave a condolence message for the family.